In one respect the introduction of these tech players can represent a blessing. Los Angeles (CNN Business) - The history of Hollywood has been punctuated by infusions of new money and players looking to get into show business. Yet the latest wave of tech giants muscling in on the content game invites new questions about how studios will adapt -- and whether the new blood reflects a boon to them or an existential threat. On March 25, Apple (AAPL) will unveil its long-anticipated plans to take a bite out of the media content business. While entering that fray won't be cheap, it's a relative pittance for a company whose 2018 revenue totaled $265 billion, with a market capitalization in excess of $900 billion. Apple's ubiquitous devices represent their own kind of network, so why not own the content being funneled through them? The same goes for the millions of consumers who flock to Amazon each day, buying all manner of products, threatening the traditional retail model. Add Google's YouTube, Facebook Watch and existing streaming titan Netflix(NFLX) into the mix, and the major studios would appear to be living on borrowed time. But when it comes to predicting their demise, close observers of Hollywood have seen that movie before. Most recently, those studios have become acquisition targets for distribution companies looking to funnel content through their pipelines. Comcast (CCZ)absorbed NBCUniversal, while AT&T (T) more recently swallowed Time Warner, since renamed WarnerMedia, the parent company to CNN, HBO and Warner Bros.
Before that, international companies bought up studios, at one point placing four of the then-seven majors in foreign hands. Indeed, a 1990 Los Angeles Times story captured the anxiety of that moment -- and seemingly foreshadowed this one -- with a sub-headline that read, "Hollywood's Brave New World : A revolution in entertainment technology is coming, and the Japanese electronics giants buying up Hollywood are leading it." Sony (SNE) still owns Columbia Pictures, while Universal has turned over three times to international entities -- first acquired by the Japanese company Matsushita, followed by the then-Canadian beverage company Seagram and the French water utility and media conglomerate Vivendi. In one respect the introduction of these tech players can represent a blessing. Given the need for programming to fuel distribution systems, studio libraries might possess new value as old means of generating revenue dry up, including the sale of reruns to TV stations. The understandable fear, though, is that companies the size of Apple, Amazon (AMZN) and Netflix can bypass past conventions, launching their own production apparatus from scratch. 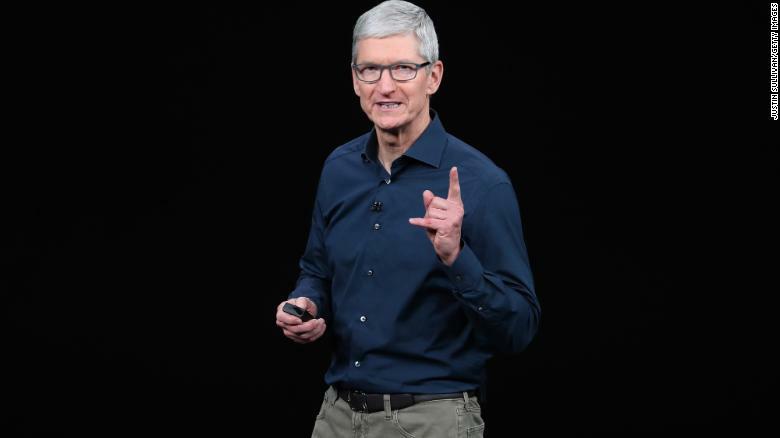 Tim Cook, chief executive officer of Apple, at a company event in 2018. The question, ultimately, is whether these companies will have both the know-how and commitment to that level of investment once they've had their noses bloodied by failure, an unavoidable byproduct of operating in the entertainment space. There's already been some trial and error. Amazon has sought to refine its theatrical release pattern, and pushed in 2017 to find a high-end series -- its own "Game of Thrones" -- as part of a strategy conceived under CEO Jeff Bezos. YouTube, meanwhile, has rebranded its premium service, while seeking to find a balance in terms of episode lengths and budgets for its shows. Thus far, the clear beneficiaries of all this have been talent and their agents, as new players -- beginning with Netflix -- bid up the prices for big names. Netflix punctuated that point with lucrative deals for top producers Shonda Rhimes, Ryan Murphy and Kenya Barris, which studios fear will only drive up the cost of doing business. When Matsushita agreed to acquire Universal in 1990, Variety ran a headline in Japanese (without translation) that read, "Buyer beware." The warning turned out to be rather prophetic, as then-Variety editor Peter Bart noted in a column a decade later amid a new wave of overseas investment, writing, "The Europeans have had as many problems as the Japanese in trying to get on Hollywood's wavelength." For their part, the studios are seeking to control their own destinies, which explains Disney's decision to bulk up through its acquisition of most Fox entertainment assets, which closed this week. Additional deal-making is almost sure to follow. It's too soon to clearly determine whether the tech giants will succeed or become the latest to discover that succeeding in "show business" -- however glamorous the industry might appear -- isn't as easy as it looks. If the latter proves true, they won't be the first deep-pocketed players to march into the content business with high hopes, only to realize that trying to get on Hollywood's wavelength can leave you with a case of bad vibrations.